This cave is quite dark, so be sure to bring some source of light if you don't have a form of night vision. The exterior to this cave is Forgotten Vale. There are two entrances to the cave. An upper entrance is found by heading north from the Wayshrine of Resolution until you reach a small settlement containing two tents and following the path to the right, up and across several bridges and past several Falmer settlements. The lower entrance is found from the same small settlement, but continuing along the shore heading southwest until you reach a group of five chaurus cocoons, with two of them being occupied and two orichalcum ore veins among them. A short distance further is the entrance. There are four more orichalcum ore veins starting immediately to the left of the entrance and three occupied of five more chaurus cocoons. The last of the ore veins is in the corner on the opposite shore. Upon entering the upper entrance you'll find yourself in a dimly lit passage heading west, south and west again as it descends. At the bottom there is a glowing mushroom on the wall, by a turn to the north and the start of a ramp that winds around the outer wall of the cave in a spiral. 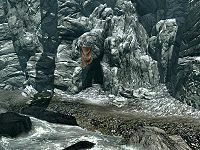 There are many Falmer hives within this cave, but most appear unoccupied. There are two Falmer, one a magic-user patrolling the upper part of the ramp. Between the first and second Falmer hives there is a narrow opening on the outer wall, which leads to a chamber containing a rare Shellbug. These creatures need to be mined with a pickaxe for their chitin not attacked and looted. A short distance further down you pass an empty alcove. There is a central column of rock surrounded by scaffolding. At the bottom the path passes into a second chamber. Off to the left beyond more scaffolding is a chaurus hunter and chaurus on the ground level with a high level Falmer inside a tent above. There is a Falmer chest against a thin rock pillar on the ground level. An earthen ramp to the right leads up to a walkway and terrace against the southeastern wall. The tent is empty apart from the leveled Falmer and from here across a second walkway to the northeast in an empty chamber with a ledge running along the northern wall. This can be reach by jump up to the immediate right of the tent and with some skill at climbing, however both ledges are completely empty. To the east is the lower entrance. You may be unable to mine shellbugs after they respawn. Leaving and reentering the cave will enable the shellbugs and you can then mine them normally. You may not be able to interact with some of the glowing mushrooms. This page was last modified on 16 February 2016, at 15:00.